Yesterday, the first webinar-workshop was given for the Linkedin Group The ‘Better Together’ Approach. Subjects attended at the BTA-001 Webinar-Workshop addressing Social Media Integration. The recording for the presentation is not very good as it was ‘open mike’ – always a mistake! But it is what it is – may have to make a new recording altogether at a future date. Many items I was prepared to present were skipped over including the Bonus of the time tracking forms, which are located here in PDF format — social media management and time tracking forms. All the interruptions make for a bad presentation, overall. I got lost in my own presentation! Yikes. I am looking for a better place to have the Power Point presentations uploaded for future FREE webinars. If you have suggestions for this, please leave them in the comments. I have found Slideshow.com which is in beta and Slideshare.net, however I don’t think they offer some of the perks that Prezi offers for a paid account. As these webinars are free, I will not pay to upload and use them online. I do want the original presentation as I made it to be view-able and not skewed to grayscale ( like at Prezi for free accounts). HEY! Leave me a comment on what you learned that was new or if anything was left out (obviously) that you need to know. Please stay ON TOPIC with your comments here. Thanks Folks – it was nice to spend my Sunday afternoon with you all. I finally broke down and put the slide show into PDF format. Without the seminar, it (of course) does lose the punch and direction needed but the outline IS there. 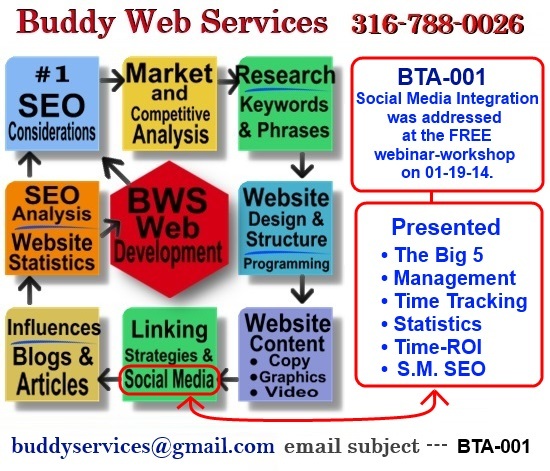 Here is the Social Media Integration Slideshow in PDF format.